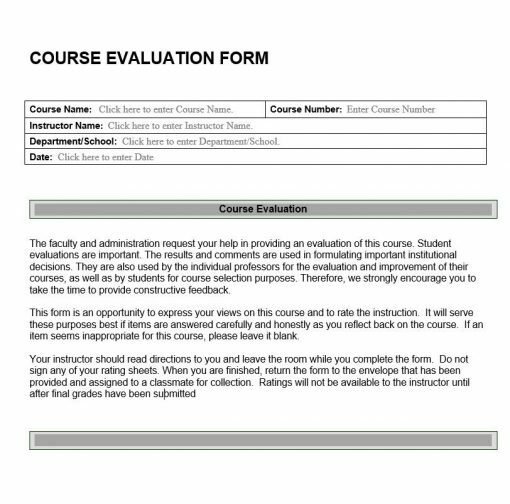 Course Evaluation Form provides an opportunity for students to offer feedback on both the instructor and the course. Areas of review include student participation, quality of course materials, instructor performance as well as general appraisal information. 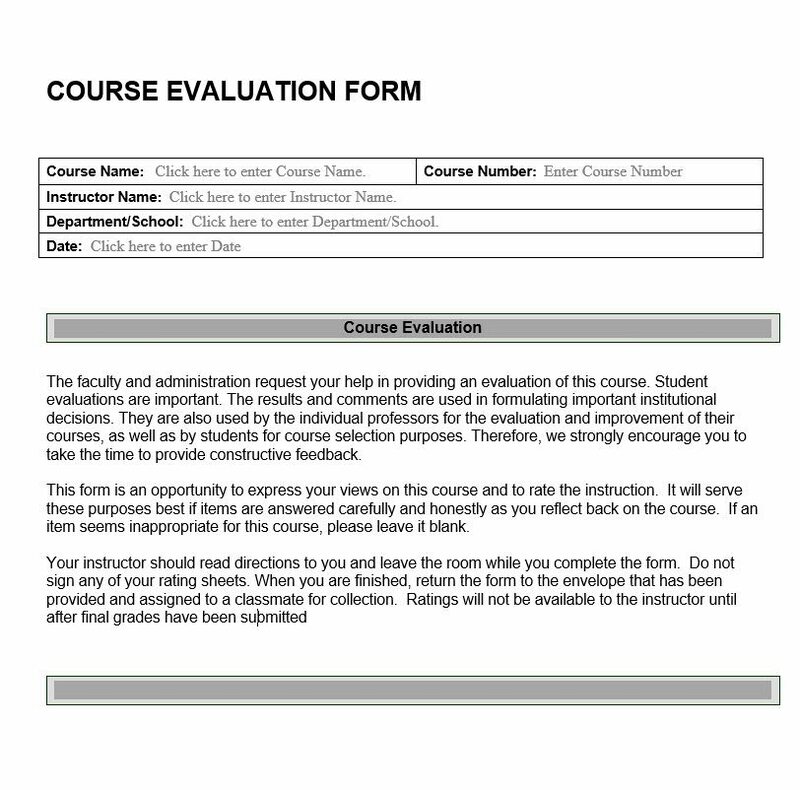 Most educational institutions have their faculty members distribute a course evaluation form at the end of the term in order to get student feedback about the class. The feedback becomes part of the faculty member’s teaching record. The scores can be used in making salary and promotion decisions. Course evaluation for generally include variables such as communication skills, organizational skills, enthusiasm, flexibility, attitude toward the student, teacher – student interaction, encouragement of the student, knowledge of the subject, clarity of presentation, course difficulty, fairness of grading and exams, and global student rating. The classroom experience is a two-way street. Students get feedback as a crucial part of their learning experience. Educators need student feedback too, in order to learn from them and improve into better teachers. Every group of students is different, leading to a different class community, a different class chemistry. Feedback from students about their impressions of the course can help us figure out ways to improve a course for that particular community. Will those changes work for the next group to walk into your classroom next term? Maybe, maybe not. That community will be different. 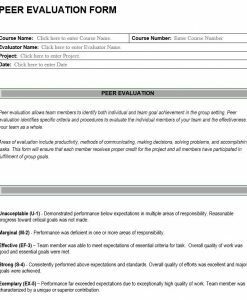 As an alternative, use this course evaluation form to gather feedback mid-semester if you want to get some insights into how the class is doing this term. Many instructors find this feedback to be quite valuable. You can use student input mid-semester to discover what’s working and what’s not in time to make changes before the end of the term. Summative evaluation occurs at the end of a semester, usually a week or two before the last day of class. The evaluation is performed by the current students of the class. Students have the option to reflect on the teachers’ instruction without fear of punishment because course evaluations are completely confidential and anonymous. 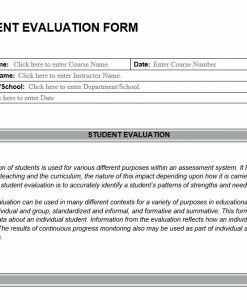 Typically, the course evaluation form is distributed by a student while the teacher is out of the room. It is then sealed in an envelope and the teacher will not see it until after final grades are submitted. It is important to allow the student to be able to provide useful and honest feedback. This feedback is to be used by teachers to improve the quality of their instruction. The information can also be used to evaluate the overall effectiveness of a teacher, particularly for tenure and promotion decisions. Formative evaluation typically occurs when changes can take place during the current semester, although many institutions consider written comments on how to improve formative as well. 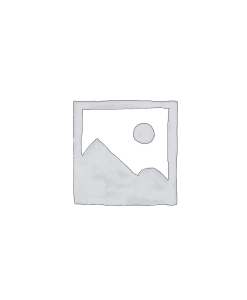 Typically this form of evaluation is performed by peer consultation. Other experienced teachers will review one of their peer’s instructions. The purpose of this evaluation is for the teacher to receive constructive criticism on teaching. Generally, peer teachers will sit in on a few lessons given by the teacher and take notes on their methods. Later on, the team of peer teachers will meet to provide useful, non-threatening feedback on their lessons. The peer team will offer suggestions on improvement, which the said teacher can choose to implement.